​​​AUSTIN - Austin’s tech industry attracts young, highly skilled workers who prefer denser, place-based, central-city living. The first half of 2016 had 37 office leases of more than 100,000 sf, primarily fueled by corporate relocations and expansions. Since 2015, 119 relocations or expansions have occurred, 80 percent of which were by technology firms. Click to see how Dallas-Fort Worth fared, Major tech market? Dallas-Fort Worth hits the Tech-Thirty list​. ​Check out Austin Office Market Research. 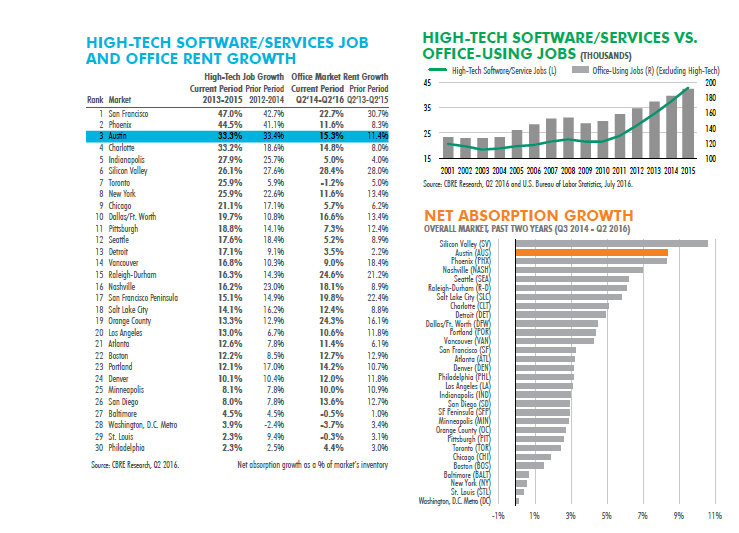 ​​​Click to see CBRE's full Tech-Thirty 2016 report (PDF), jump ahead to page 34 for Austin.